Spicy Cheeto’s and sushi? Taking the sushi burrito trend to the next level. The Low Key Poke Joint in Garden Grove California saw sushi burritos and spicy cheeto’s and decided that the two were meant to be together. How have the world’s top sushi minds missed the obvious pairing? The hot, spicy crunch of cheeto along with the freshness of tuna and salmon all wrapped up in a massive sushi burrito might make Jiro shudder, but the restaurant’s fans are eating it up. The Low Key Poke Joint is the epitome of the modern restaurant. It has offered freebies for Pokemon Go players, has a slick website and instagram feed, and is always at the front of trends in the sushi world. They even offered a sushi burger! After opening in December of 2015, they have found success by staying ahead of the crowd. Just a tip – traditional Japanese sushi does not include cheetos. Putting them on sushi burritos? Sure, why not? While putting cheetos on sushi burritos (hey, that rhymes!) 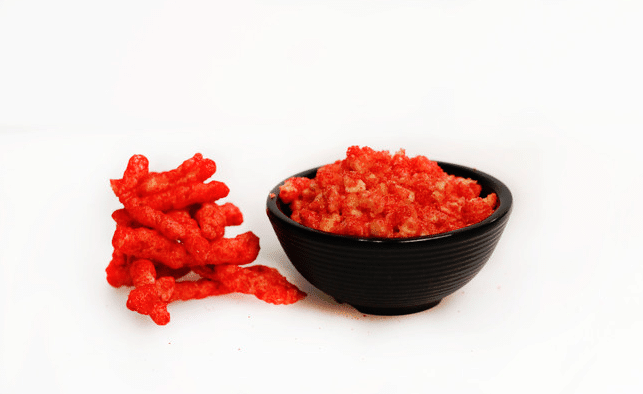 is the most extreme example of what the restaurant offers, they love spicy cheeto’s so much that they offer the topping on all of their meal choices. Another unique topping you can put on your selection is a quail egg – because normal chicken eggs are just too boring! Is the sushi burrito a culinary delight or a monstrosity? You decide in the picture of a sushi burrito below! Some of the crazy things restaurants are doing in the sushi world might cause sushi purists to grumble, but you can’t fault a restaurant for being creative if the customers like it. 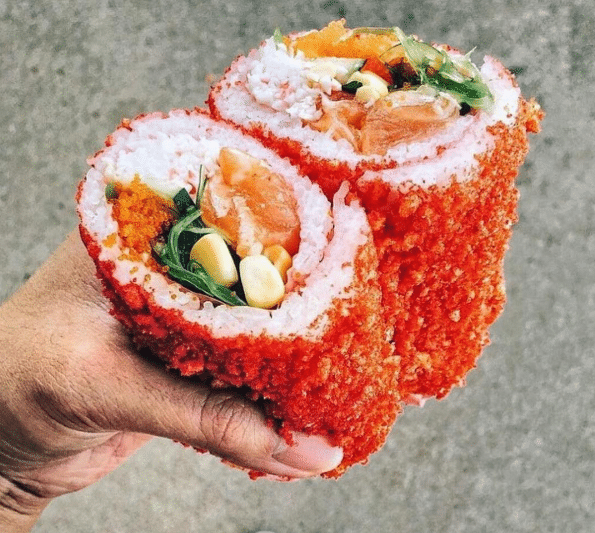 Or maybe you can – is wrapping sushi into a giant burrito and coating it with crushed spicy cheeto’s taking things too far? Would love to hear what the readers think!